I was born in 1967. After a graduation in Business Administration I worked for the HR-Division of the German central bank. These days, I am responsible for the study organization office a well-known German University. I love to travel around the world and have already visited a lot of wonderful spots. I met people, who showed me how necessary tolerance and acceptance between different cultures and religions are. Of course, all these experiences have had a strong influence on my novels. But sometimes I do not have to invent the stories I tell, there are some plots which are just waiting for someone to tell them. Two times, such strange things happened to me, and one of those outstanding situations made me become an author. The following year I flew to Australia. It was my second time ‘down under’. My wife and I went there some years before and we fell in love with the country. For three weeks, I drove though the Outback areas and tried to find myself coming through and dealing with loneliness. When I went back to civilization, I reached a little fishermen-town called Albany. One morning, when I was hiking on a coast trail, I found the right place: a steep cliff. Of course I had my bottle with me. So I sent a prayer and threw it: Usually these days you are sent a confirmation notice, like “Message sent”. But of course nothing like this will happen if you send a message-in-a-bottle. But sometimes the unexpected will happen. How? What happened, was unbelievable ... shortly spoken: My wife got the message and she sent me a confirmation. How is that? 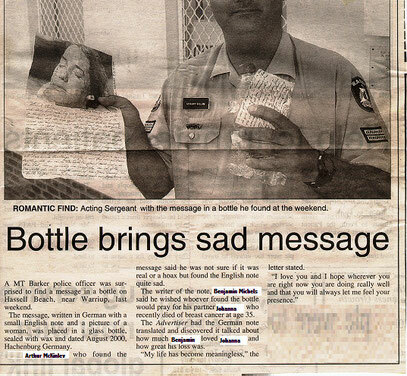 The bottle was found by an Australian police-officer. He took it to a newspaper. They published an article with a photo of him and a short text. In the text they mentioned my name and Hachenburg, the town I live in. The newspaper was read by a young German woman in Albany, she lives there because she is married to an Aussie. She recognized the city of Hachenburg, because she originally comes from that region, which is called the Westerwald (translated: Western-forest or West-wood). Her parents still live there, in the town of Hoehr-Grenzhausen, which is famous for pottery and the glass-producers Rastal and Sahm (look at the glass, when you drink a beer. It does not matter whether you are in the US or in South Africa or Australia … you will often read the company's name Rastal). After a while I wrote down the story of my message-in-the-bottle, because I wanted to memorize this outstanding event of my life. I thought, I have to write everything down, so I would be able to remember every detail when I am old. Otherwise people will say: "Oh look at this old man, he is mixing up fiction and reality. He is getting nuts ..." When I showed the first 30 pages to a friend, he recommended to keep on writing. He said it will be a good way of therapy, too, to deal with my sorrow.So I went on writing my own story: The story of Hanna (Susan) and Benjamin (that's me). The manuscript became a size of nearly 700 pages; the story of the message-in-the-bottle became the prologue! One day another miracle happened: I mentioned on XING (social network) that ‘I like writing’ and that ‘I had already prepared a manuscript’. I got a mail from the publisher Acabus-Verlag Hamburg and they asked what the manuscript was about. I answered the mail and some days later, they offered me a contract. After the lectorate was finished, they published my story in the way of a modern trilogy: Sunrise - Sunshine - Sunset A modern, dramatic, lovely and unbelievable LOVE STORY (comparable to Erich Segal, who published his wonderful story in the 70s and promoted the tissue-industry a huge surplus). The trilogy takes you around the world (mostly to the US: like Los Angeles, NYC, Hawaii, Washington D.C. but to Australia, too). And now I have finished two new projects: “Erika Walker - An American Frollein" and "Bloodacademy - release me from evil". There is an English version of exposé below, if you want to know more about that outstanding and unbelievable story. The copyrights are still available! ... aktuell würde ich Ihnen gerne die Geschichte "Erika Walker - An American Frollein" erzählen. Begeben Sie sich auf eine atemberaubende Reise durch das letzte Jahrhundert?